Whenever I discover something I like I can have it over and over again. That applies to music, movies and of course food. 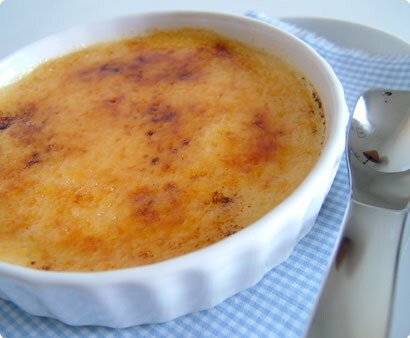 Now that I have figured out how to properly make crème brûlée, I want to do it in all possible colors, styles and flavors. So this month’s edition of SHF (Cooking up Custard) hosted by Elise of Simply Recipes came in perfectly handy for more crème brûlée adventures. What sparked the idea for a Nutella flavored crème was actually a Nutella-cookbook I decided to buy as a gift for a nutella maniac. After reading some reviews on the book, it became quite obvious that the recipes contained in it, had basically one thing in common: 2 tbsp of nutella. Ok, if that’s all it is to it, why bother and spend any money on the obvious?! Picking a more or less standard crème brûlée recipe as a basis seemed like a good idea, including- …three spoons of Nutella! After preparing the crème, I divided the mixture, left about two thirds normal and added the Nutella to the last third. In a last step I tried to combine the two crèmes in one little dish, to provide a twofold taste experiences. It turned out so good, even O., usually not too thrilled about Nutella, liked it a lot. A different variation of crème brûlée I wanted to give a fruity touch. I chose nectarines, because – sautéed in butter with a bit of brown sugar and a decent shot of Marillen Schnapps – they very nicely complemented the crème. In case you’re wondering where they’re hiding, the pieces of sautéed nectarines were placed at the bottom of the dish just before pouring in the custard. For general cooking direction please refer to Chocolate Crème Brûlée. Oh my! I tried to make custard the other day for this SHF and failed, miserably. At least I got a funny post out of it. But my goodness, these are just gorgeous! Brava! Yuuuuuuuum! The nutella one looks awesome. Love crème brulé and this one looks just wonderful. Mmm.. Nutella custard, what a fantastic idea! I love the picture of your egg yolks, such beautiful light. Yippee, I love nutella and creme brulee so that sounds like heaven for me. A whole nutella cookbook? I think I know a few people who would kill to get their hands on one of those. Only kidding. 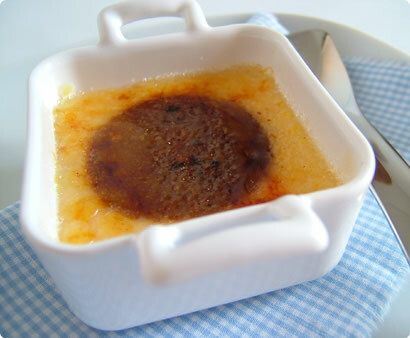 Both creme brulees look divine! I have a friend whose husband is a Nutella addict. I can't wait to show her this recipe! Great job! The nectarine creme brulee sounds very interesting. I have to search for the Nutella cookbook now since I am a Nutella addict. I rediscovered my love of crème brûlée this past summer, and now am looking forward to re-familiarizing myself with it in my own kitchen. Thank you for the inspiration and ideas! Your two creme brulees look fantastic. And how can you go wrong with nutella! All that creamy sweetness of the custard paired with the delectable taste of chocolate and hazlenuts...oh my...there goes my heart rate again! Thanks so much for joining in on SHF - it certainly wouldn't be the same without you two! The creme brulees sound and look wonderful. How wonderful it would be to find those nectarines hiding underneath! 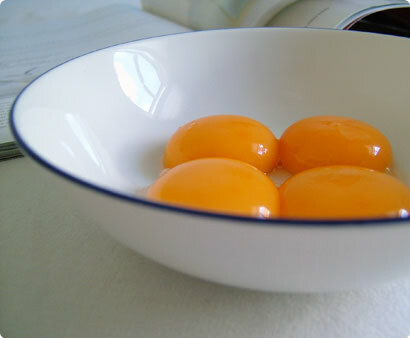 And aside from that I cant help but notice those beautiful golden yolks, those are some gorgeous eggs! Can you tell me where you got the nutella cookbook and where I can find it??? My boyfriend is obsessed and I'd love to get it for him!! !